After much discussion about the knitted B4 Bag from Once in a Bloomoon Creations, I was inspired to crochet a similar bag. This is especially for those people who don’t knit. To see the original knit version click here. Please join if you are interested. Before beginning bag read notes at bottom of pattern. Popcorn Stitch: 5 dc in st, drop loop from hook, insert hook in top of first dc of group, pull dropped loop through. Turn your work around and mark a horizontal loop of the round just worked with contrasting yarn. This is the row of loops you will go into on the welt round. Turn work back to right side and proceed. ROUND 18 (Welt round): With Red yarn (changing colors). Ch 1, sc in the next st and the unused loop of the st in the round marked below, repeat around. This will create a welt that is three rounds wide. Turn your work around and mark a horizontal loop, of the round just worked, with contrasting yarn. This is the row of loops you will go into on the welt round. Turn work back to right side and proceed. ROUND 28 (Welt round): With red yarn. Ch 1, sc in the next st and the unused loop of the st in round marked below, repeat around. This will create a welt that is three rounds wide. ROUND 42 (Welt round): With red yarn. Ch 1, sc in the next st and the unused loop of the st in the round marked below. This will create a welt that is three rounds wide. Lay bag flat and mark center st on front, count 6 sts left of center and place marker in that st. Remove center marker. Turn your work around and mark a horizontal loop of the sc round with contrasting yarn. This is the row of loops you will go into on the welt round. Turn work back to right side and proceed. Reinforce the area where the handles and bag are joined by weaving the tail back and forth through the stitches an inch or so above and below the seam line a few times. You can now felt the bag. Block on a box placed inside a plastic bag. The bag should fit the box tightly. It should be a struggle to get it on the box. I usually put on a pair of rubber gloves so I can get a good grip on the bag. This will make the corners nice and squared off. Or put a plastic bag inside bag and fill with raw dried beans for a softer more rounded appearance. It will take several pounds to block in this manner. If you use a different yarn than the Paton’s Classic Merino your results may be different than mine. But isn’t that half the fun of felting? Don’t fret if your stitch counts on the bottom don’t come out exactly like the pattern. As long as you increase three sc at each end and end up with 96 stitches, close counts. If in the process you end up a stitch under or over 96 just do an increase or decrease to get back on track. Felting covers a multitude of sins. When you make a hdc, there is a horizontal loop on the back of the stitch, this loop is the one that you will be crocheting into to make the welt rounds. When joining colors or a new ball of yarn, tie an overhand knot. Don’t worry about neatness the felting will hide any unevenness. I do weave the ends in slightly, and trim ends after felting. The beads I used are: A Touch of Glass item # 25735-06 SM Glass Crow (Pony) Jet. I purchased them at Michaels, one package is enough to complete the bag. It can be difficult to find beads with a large enough hole. I’ve also used roller beads purchased mail order from Rings and Things. Even with the 25735-06 beads some of the holes may be too small for your size 3 hook, you can use a size 5 but it is more likely to split the yarn. Keep tension on the yarn as pulling it through the bead and it will be less likely to split. When crocheting with two colors, it is only necessary to mark the first row of loops to work into to create the welts. On the subsequent rows you will be changing colors and can use that change as your marker. I blocked my bag on and Orville Redenbacher Popcorn box from Costco that holds 24 microwave packages. 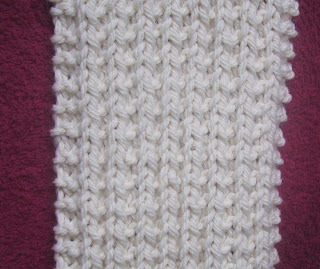 Third in the scarf of the month series, My March Scarf is knitted with a simple two row rib pattern and a garter stitch border. Instructions are included for either bulky yarn or worsted weight. Repeat rows 1 and 2 until scarf is as long as you like. Knit 3 rows and bind off. There is now a Yahoo Group to post photos of and discuss items made from my patterns. Please join if you are interested. 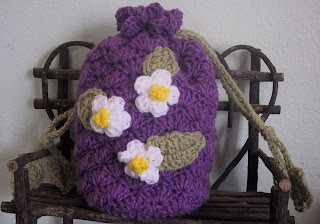 An easy to crochet drawstring bag with leaf trimmed drawstrings. The base is a covered CD, giving the bag a firm bottom. Round 1-4: Rep rounds 1 - 4 of inside base but DO NOT fasten off. Ch1. Round 21 (eyelet round): Ch 3, [ch 1, skip 1 st, dc in next st, ch 1, skip 1 st, dc in next st, ch 1, skip 1 st, trc in next st] repeat around, ending with slipstitch in third chain of ch 3. Note: Leaves are different sizes. Ch 12, dc in 4th from hook, dc in next 4 chs, hdc in next 2 chs, sc in next ch, slipstitch in last ch, ch 1, working in unused loops of beginning ch, slipstitch in same st, sc in next st, hdc in next 2 sts, dc in next 5 sts, ch 2 and slipstitch in base. Ch 90, slipstitch in 2nd ch from hook, sc in next ch, hdc in next ch, dc in next 4 ch, ch 2, slipstitch in same st, ch 2, dc in same st and next 3 sts, hdc in next st, sc in next st, slipstitch in last st. Attach yarn with a slipstitch in join at base of leaf just completed, slipstitch in each ch to other leaf and slipstitch in join at base. Weave drawstrings in and out of eyelet round starting on opposite sides. Tie the ends of drawstrings in an overhand knot about an inch from the leaves. Round 1: Ch 3, working all sts in 3rd ch from hook 1 dc, ch 2, slipstitch, (ch 2, 1 dc, ch 2, slipstitch) 4 times. (5 petals). Fasten off leaving a 8 inch tail for sewing flower to bag. Ch 2, 3 sc in in 2nd ch from hook, slipstitch in first sc. Fasten off, leaving a 6 inch tail for sewing to flower. Sew flower center to center of flower. Ch 5, slipstitch in 2nd ch from hook, sc in next ch, hdc in next ch, dc in last ch, ch 2, slipstitch in same ch as last dc, working on opposite side ch 2, dc in same ch, hdc in next ch, sc in next ch, slipstitch in last ch. Fasten off leaving an 8 inch tail for sewing to bag. The prize winner of the Red Scarf Contest has received her prize, so now I'm able to post a photo of it without spoiling the surprise. It was fun for me to sponsor this contest, I may just do it again next year. Congrats, Kami. Keep on knitting! Red Scarf Project drawing for yarnie prize. Today was the day! I put all your names in a bowl, stirred them up and picked one. I think you will all be please to learn the winner is Kami. Kami is a 12 year old, almost 13, who is learning to knit in 4H. She knit a Condo Scarf and sent it in along with a couple of her mother’s to the Red Scarf Project. Kami, who lives in Montana, also crochets. 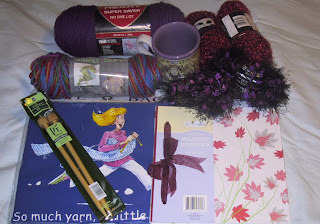 I'll post a photo of her "yarnie" prize after she receives it. I wouldn't want to spoil the surprise.